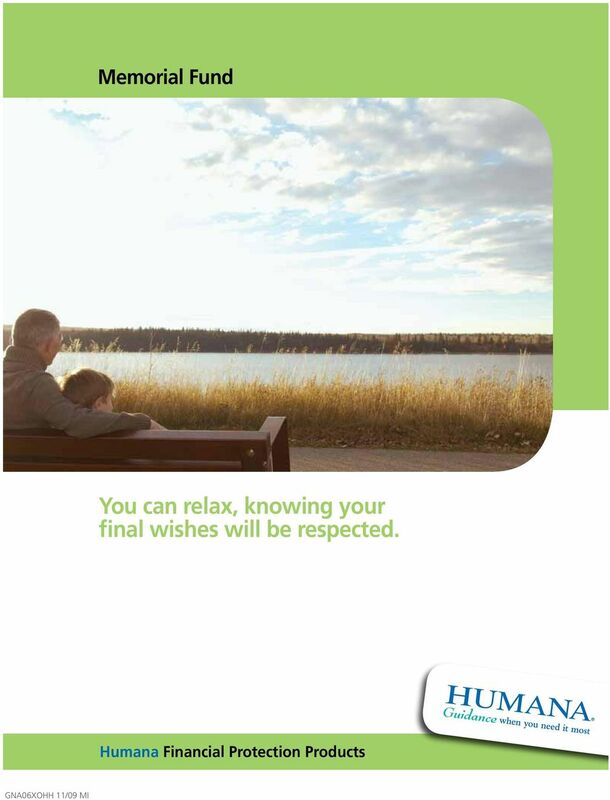 Download "You can relax, knowing your final wishes will be respected." 2 Memorial Fund Ensure financial peace of mind for you and your family. You may have already planned ahead for funeral expenses. But there are so many costs your family could face, including medical bills, legal fees, taxes, and other expenses. Humana s Memorial Fund is whole life insurance that pays cash to your designee to take care of your final expenses and more. The plan lets you relax knowing that: 4 Your final arrangements can be carried out 4 You ll avoid burdening your family with unexpected costs 4 You re taking the future into your hands today The Memorial Fund is whole life insurance that has guaranteed cash values. As the policy matures, cash value in the policy grows. 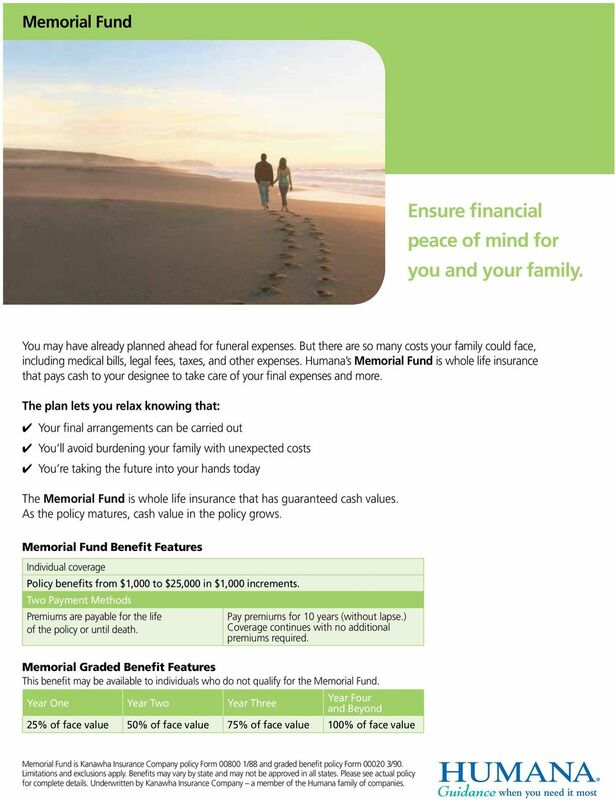 Memorial Fund Benefit Features Individual coverage Policy benefits from $1,000 to $25,000 in $1,000 increments. Two Payment Methods Premiums are payable for the life of the policy or until death. Pay premiums for 10 years (without lapse.) Coverage continues with no additional premiums required. 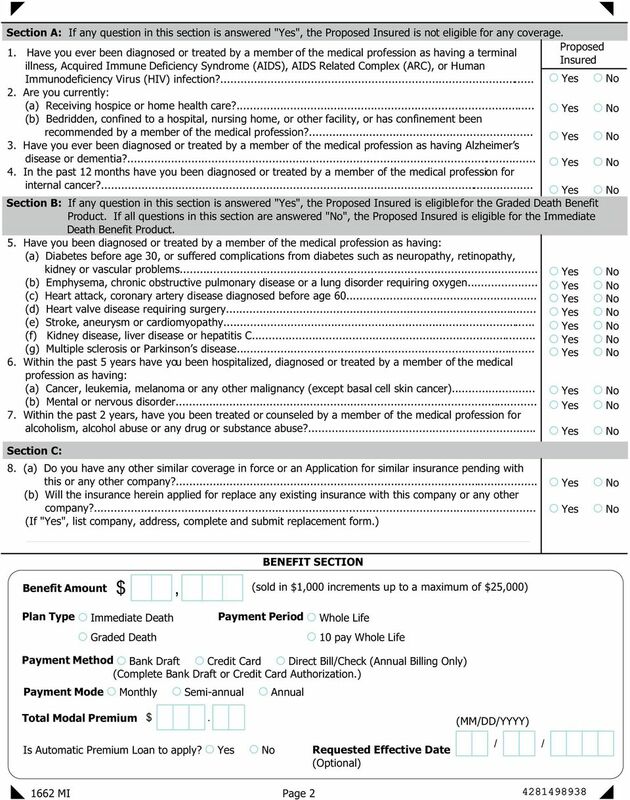 Memorial Graded Benefit Features This benefit may be available to individuals who do not qualify for the Memorial Fund. 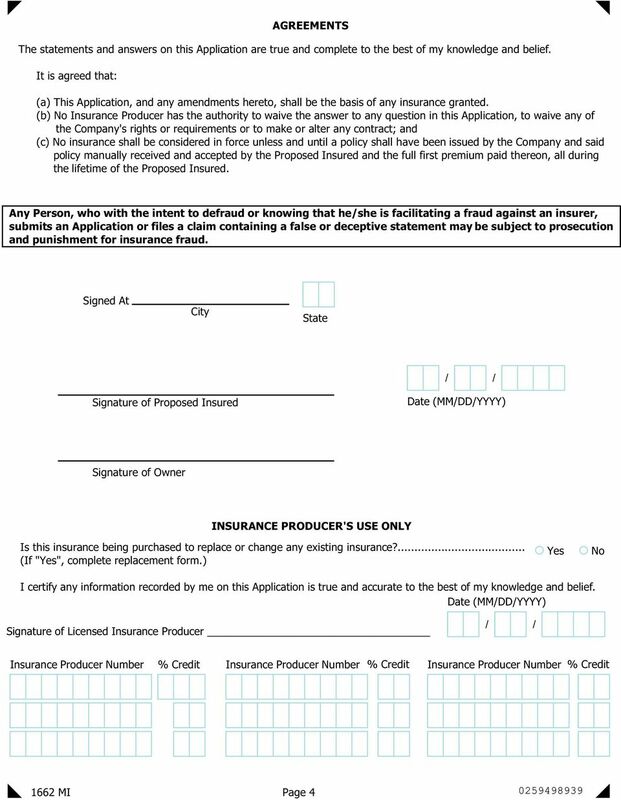 Year One Year Two Year Three Year Four and Beyond 25% of face value 50% of face value 75% of face value 100% of face value Memorial Fund is Kanawha Insurance Company policy Form /88 and graded benefit policy Form /90. Limitations and exclusions apply. Benefits may vary by state and may not be approved in all states. Please see actual policy for complete details. 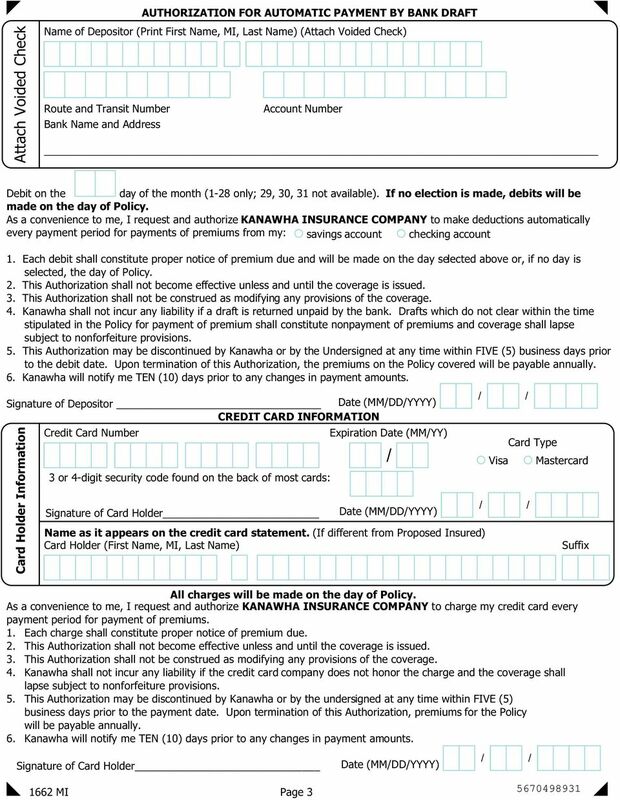 Underwritten by Kanawha Insurance Company a member of the Humana family of companies. 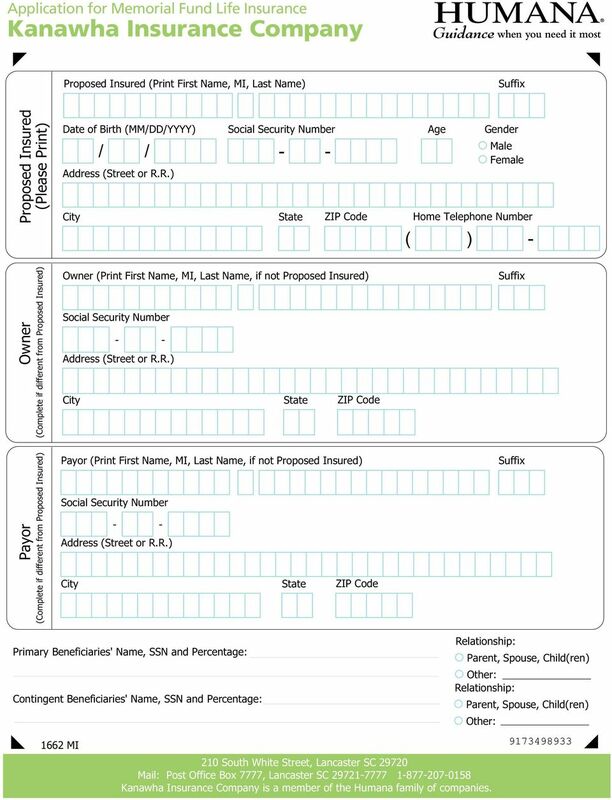 Heartland National Life Insurance Company PO Box 2878, Salt Lake City, Utah 84110-2878 Application - Cancer Insurance Part I Personal Information New Business Add Dependent? Policy Number Title: Mr. Mrs.